The Irish Benchmarking Report, “Positive Steps for Prematurity” was included in the European Benchmarking Report published by The European Foundation for the Care of Newborn Infants . The report gives an overview on the impact of preterm birth across Europe and paints a compelling picture of the differences that exist in levels of care and the lack of national health strategies concerning maternal and newborn health. It gathers together parents, healthcare experts from different disciplines, and scientists with the common goal of improving long-term health of preterm and newborn children. Their vision is to ensure the best start in life for every baby. With their activities they aim to reduce preterm birth rates, ensure the best possible treatment, care, and support and to improve the long-term health of preterm infants and newborns with illnesses. Their work focuses attention on the growing challenge of prematurity and its significant impact on the children, families and our society. They aim to reduce the enormous health and social inequalities linked to preterm birth. To address these disparities and to increase the standard of newborn care, EFCNI have initiated and are coordinating the European-wide project European Standards of Care for Newborn Health. In 2011/2012 our Director of Advocacy and Policy Making, Mandy Daly, contributed towards The European Foundation for the Care of Newborn Infants Call to Action for Newborn Health which contained10 demands by parents and health professionals to ensure that every baby born in Europe gets the best start in life. The Call To Action for Newborn Health was launched alongside the EU White Paper on Maternal and Newborn Health and Aftercare, “Caring for Tomorrow”. Europe faces a major challenge in relation to maternal and new-born health with noticeable disparities across the EU. This is compounded in the case of vulnerable groups e.g preterm infants, who require specialist intensive care and attention that is not always provided. The EFCNI-WHO event, organised in association with the Irish Presidency of the Council of the EU, comes further to a WHO Report from May 2012 that identified that preterm birth is the second leading cause of death globally for children under five. With the rate of preterm birth growing in most countries, the participants, including Mandy Daly from the Irish Neonatal Health Alliance, called for more work to be done to fight health complications and morbidities. Supported by EFCNI and WHO partners, participants called for maternal and new-born health to become a public health policy priority for all European governments. Some of the solutions discussed include the need to focus on healthy pregnancies, effective maternal care and prevention of preterm birth. Experts agreed that Caring for Tomorrow: EFCNI White Paper on Maternal and Newborn Health and Aftercare Services provides a solid foundation for identifying recommendations on how European health systems could improve. Emphasis was placed on the need to develop European high quality standards for prevention, treatment and long-term care, the support of greater research, education and exchange, as well as streamlined and targeted information for parents. The event, organised in association with the Irish Presidency of the Council of the EU (who had been invited to support the event by Mandy Daly, INHA) and in close collaboration with EFCNI’s national partners and European healthcare societies, was the first step towards developing standards of care for maternal and new-born health. Indeed, this meeting marked the establishment of an EU-wide network of stakeholders and parent representatives, led by EFCNI to create a way to benchmark existing care practices across Europe and establish recognised standards for delivering high quality care. The event featured globally recognised experts in maternal and new-born health as speakers, including Prof. Dr. Kypros H. Nicolaides, Director of The Fetal Medicine Foundation; Prof. Dr. Dietmar Schlembach, faculty member of the Friedrich Schiller University of Jena (Germany), Dept. of Obstetrics and Gynecology and Head of the Division of Prenatal Diagnosis & Fetal Physiology; Prof Dr. Luc Zimmermann, President of the European Society for Paediatric Research and Mandy Daly, patient representative from Ireland. Our European partner, The European Foundation for the Care of Newborn Infants (EFCNI) launched the activity SOCKS FOR LIFE to raise awareness for maternal and newborn health and to improve the care for preterm babies and their families. On Monday, 7 April 2014, more than 100 guests from different professions and countries, Members of the European Parliament and representatives of other European Institutions, including the Irish Neonatal Health Alliance came together to celebrate the opening of the art exhibition SOCKS FOR LIFE. For the first time ever, art lovers, patients, politicians and health professionals from all over Europe came together to raise awareness for maternal and newborn health and in particular the challenges of preterm birth. The event opened with Claudia Gahrke’s reading of the beautiful poem by Durs Grünwein. Following the warm welcome by host and patron of the exhibition, MEP Dr. Peter Liese and his colleague and EFCNI patron MEP Dr. Angelika Niebler, the guests listened to insightful speeches by Mr Rainer Wieland, Vice President of the European Parliament, Prof. Dr. Luc Zimmermann, President of European Paediatric Research Society (ESPR), Eleni Vavouraki, President of the Greek parent association Ilitominon and Silke Mader, Chairwoman of EFCNI. 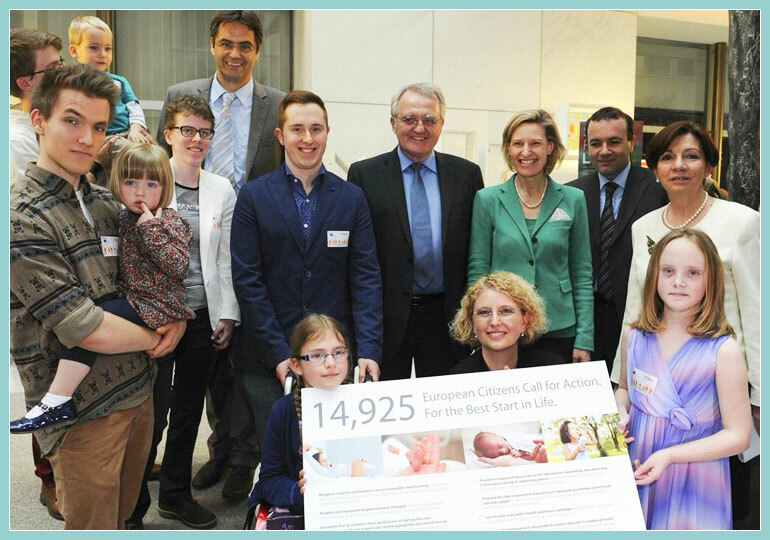 Children, former preterm babies (including Amelia McDermott Age 7 who represented the Irish Neonatal Health Alliance) and the true “little heroes” of the evening handed over the nearly 15,000 votes received for the European Call to Action for Newborn Health to the Vice President of the European Parliament Rainer Wieland. Echoing this call for improvements by European citizens, stakeholders present officially declared to collaboratively work on European-wide Standards of Care for Newborn Health. The need for harmonised standards and their development in a collaborative approach have been endorsed by many healthcare societies and parent organisations. All of them have visualized their support with their logo at the event and visitors of the exhibition could equally show their support through their signature. In January 2012 a representative from the INHA was elected to the Parent Advisory Board of the European Foundation for the Care of Newborn Infants (EFCNI). The board which consists of 8 individuals from across Europe supports and advises the board of EFCNI and acts as an conduit for the channeling of information from parent associations to the EFCNI board and vice-versa. In September 2012, the INHA was elected to the board of the NIDCAP Federation International. The INHA sit on the Advancement Committee of the NIDCAP Federation International as well as being Co-Chairs of the NIDCAP Family Advisory Council. The NIDCAP Federation International (NFI) promotes the Newborn Individualized Developmental Care and Assessment Program (NIDCAP). NIDCAP is the most comprehensive, evidence-based model of developmentally supportive care and assessment for preterm and full-term newborns and their families in the hospital, and the transition home. The NFI aspires for all newborns and families to receive hospital care and assessment in the relationship based, family integrated NIDCAP model. The NFI assures the quality of NIDCAP education, training and certification for professionals and hospital systems, and advances the philosophy and science of such care. The incidence of preterm birth, worldwide, is rapidly increasing. In Ireland, the incidence of prematurity currently stands at 4500 per annum. Over 25% of all preterm infants are also born too small for their gestational age. These infants present immediate and significant challenges to their parents and to their caregivers in Newborn Intensive Care Units. They are hypersensitive, difficult to feed, and difficult to calm. More than 50% will go on to develop learning and emotional disabilities, requiring special education and mental health services. The challenge is even greater in developing countries. Research has documented the beneficial effect of NIDCAP in terms of shorter intensive care and overall hospital stay, better weight gain and improved behavioral outcomes that endure beyond infancy. Studies have also documented that the NIDCAP approach enhances brain structure and function when measured by sophisticated medical techniques such as EEG and MRI. What is the Newborn Individualized Developmental Care and Assessment Program (NIDCAP)? Newborn Individualized Developmental Care and Assessment Program (NIDCAP), developed by Heidelise Als, PhD and her colleagues, is a comprehensive approach to care that is developmentally supportive and individualized to the infant’s goals and level of stability. Further it seeks to support families and the professionals who care for them. It provides and trains professionals within this NIDCAP framework. One component of the model of care is the direct observation of the infants within their environments in the newborn intensive care setting. Using a detailed observational tool, often referred to as the NIDCAP observation, the infant’s behaviors can be interpreted as steady and relaxed or as representing stress or discomfort. By observing and then interpreting behaviors of infants within their environment and as reactions to care they receive, developmental care plans can be developed, with the caregiving team, that best support’s the infant’s overall goals and efforts at self regulation. The NIDCAP model, which includes this observation, describes the development of an ever-more supportive and developmentally appropriate nursery environment (from the actual physical space to the delivery of care), and interrelated, the increasing nurturance of the family and the staff, and the continued education and mutual collaboration of the staff (from the direct caregivers through the administrative leadership). The NIDCAP approach to care requires in-depth training and provides in turn a highly valuable resource in support of developmental support and care provision by professionals and families. Who may be assessed with the NIDCAP? Preterm and full-term newborns in the newborn intensive care setting are appropriate for NIDCAP assessment. Infants are typically observed in their bed spaces within the nursery before, during, and after caregiving experiences. In November 2015 the INHA were appointed Patient Representatives for the European Medicines Agency (EMA). Most of the EMA’s scientific evaluation work is carried out by its scientific committees, which are made up of members from EEA countries, as well as representatives of patient, consumer and healthcare-professional organisations. These committees have various tasks related to the development, assessment and supervision of medicines in the EU. The EMA is responsible for coordinating the EU’s safety-monitoring or ‘pharmacovigilance’ system for medicines. It constantly monitors the safety of medicines through the EU network and can take action if information indicates that the benefit-risk balance of a medicine has changed since it was authorised. The EMA’s committees are involved in referral procedures to resolve issues such as concerns over the safety or benefit-risk balance of a medicine or a class of medicines in addition to coordinating inspections requested by its committees in connection with the assessment of marketing-authorisation applications or referrals. This collaborative project under the auspices of EFCNI brings together health experts, professional societies, civil society organisations, representatives of national parent organisations (including Mandy Daly from the INHA), third party advisors and industry partners to develop harmonised reference standards for the care of preterm and newborn infants in Europe. The standards will cover a wide range of topics from care at birth, neonatal intensive care as well as follow up and continuing care to ethical questions, education of neonatal health professionals, data collection and documentation. To this end, interdisciplinary Topic Expert Groups will be dedicated to one topic of newborn health. The standards will run through an extensive consultation process before being publically available online end of 2018. Providing a set of collectively developed standards for newborn health will be an important step towards improving the quality of preterm and newborn care in Europe.